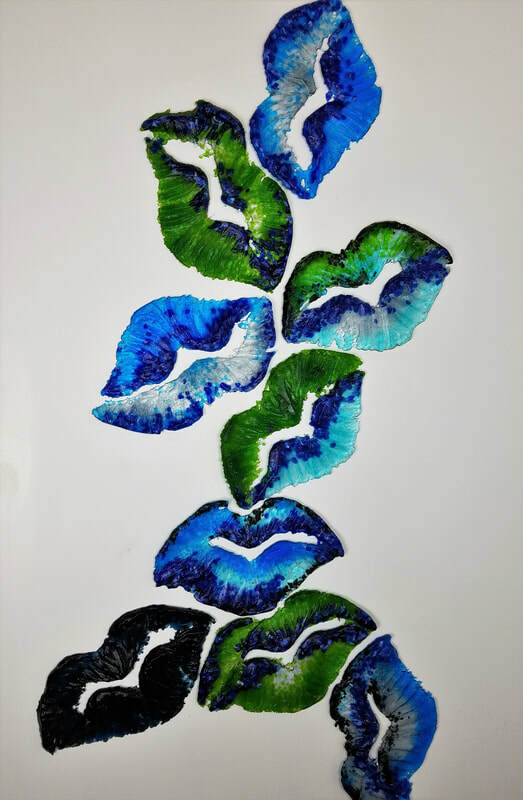 These pieces are made of individually cast resin or glass, combined with various materials, such as bedsprings, fishing hooks, swivels, wire, hardware and dyes. In recent installations, such as Icons, Cones, and Lures, I complete by adding hand written fragmented phrases, dirges and chants on the back walls, thus pairing the structural soundness of durable materials with more elusive and fragile elements, transforming the room into a juxtaposition of expectations. The Lures series are each hand cast of resin or glass, with added hooks, wire, various hardware and smaller cast objects designed to simulate one's desire to entice, arouse and capture. meditative process, which documents the experience. As installation fractions or individual pieces, this work is at once translucent and dense, ephemeral and visceral, which builds and expands my themes of danger, desire, engagement and selective abandonment.